The idea of superheroes may seem silly to some. Grown men and women in colorful tights fighting bad guys pretty much sums it up right? True fans know that’s not the case. Most of the movies we see today involving superheroes do their best to depict what we’ve seen in comics and animated shows. Then, something comes along to change the minds of the masses who find it silly. I’m talking about the Dark Knight. If you haven’t read my review of it, please do so, but TDK changed superhero film. It introduced people to a new brand of superhero. Nolan put story first instead of good guy vs. bad guy action. Gotham as a city got just as much development as Bruce Wayne. We got to experience Batman in an entirely different way. Now as a comic book fan, I understand the whole Marvel vs. DC thing between fans. No matter what you say to some fans, they will always like one or the other. I don’t get involved with that because I love all heroes. Personally, I believe the world of comics shouldn’t be turned into a sports or political arena. People tend to make up their mind about a product just because of the company behind it. My point is, I’ve noticed people’s dislike of the style of the Marvel Cinematic Universe. The Dark Knight resonates with a lot of people because of the grittiness of Batman’s world, his city. In the MCU we see some characters who don’t necessarily have to deal with everything Batman does. There isn’t a city in the MCU that is close to Gotham’s level of corruption. We see a certain level of jocularity because of this. This levity in the MCU causes some comic fans to be turned off because of the realness of Nolan’s trilogy. I believe that comparison is unfair. I still do understand the complaints. In my review of the Civil War comic, I talked about how the movie didn’t have any consequences. By the end of the film, Iron Man is confused, and Cap breaks the other heroes out of jail. Are the Avengers a thing still? Will the Accords ever get signed? Is the government still going to be pursuing Cap? There wasn’t any closure in terms of the Civil War aspect. I like it when companies take risks. Superhero companies taking risks involve them pushing their limits. Daredevil does that and then some for Marvel. That’s the big question going into this show isn’t it? They waste no time giving us an answer. We see his accident right off the bat. We then get to see what he does for a living. The main reason I loved Daredevil in this show is because of how intertwined his two egos are. They really aren’t that different. The show does a good job of depicting that with his early fights and interrogations. He doesn’t try to be anybody else when he’s in the mask. Those frustrations he shows while fighting, are the same he shows as a lawyer. I found many similarities with Batman and Daredevil as I watched this show. The two care a whole lot about justice. They believe that the evil deserve what is coming to them no matter what. Both of their cities are terrible as well. But the main difference to me is how they identify with their alter egos. Sometimes, Batman as a symbol overtakes Bruce the man in the suit. Other times, it is used amazingly as Batman uses his influence to get answers out of bad guys. In this show, we see Daredevil struggle with his alter ego. He doesn’t fully embrace it until he notices it can get him answers as well. Fear is an essential part of his identity just as it is Batman’s. Another thing this show did a great job with is showing us the importance of Matt’s father. We understand why Matt is so proud of his last name. He didn’t grow up with much at all, but from what we see of him as a kid, he never wanted much. He loved being around his dad and loved how tough his dad was. Murdock’s never quit. It was instilled in him at an early age. Jack knew that he wasn’t the best father (hell, he was taking care of his kid and trying his best to provide for him. That’s a good father to me) but he wanted his son to know what it meant to be a Murdock. Obviously, that cost him his life, but it is definitely important to Matt’s character development. Mainly because his dad instilled something in him that he holds to his core every day. That never say die attitude is definitely showcased when he fights. 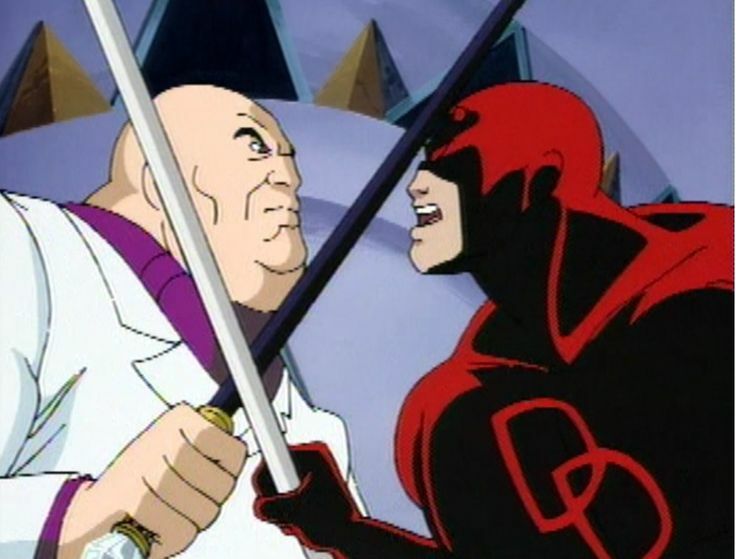 I love how we get to see Daredevil as an amateur because I always remembered him as a skilled martial artist. The show would have been boring if he would have beat every bad guy in two moves. I love how he has to overcome in almost every fight this season. All of his struggles pay off at the end though when he has his last fight with Kingpin. The sign of a good villain, is when he/she show some similarities to their hero nemesis. It’s a line we hear often. “You and I, we’re not so different.” This show builds up a different side to Kingpin that I didn’t expect to see. I remember Kingpin from the Spider-Man cartoon but I literally knew nothing of his upbringing or his motivations. The show gives us a man who wants to make his city better. Or at least that’s what he says. They build up his romantic side with Vanessa. I love how they gave us a Kingpin who was somewhat impaired too, mentally speaking. We see the scene with his father where he dad makes him beat up a boy. Later, his dad is hitting his mom and Kingpin starts to beat him with a hammer. As he beats him with the hammer, he repeats the phrase “Keep kicking him,” over and over again. It was a brutal scene to watch, but it gives us insight to his motivations. Kingpin later decapitates one of the Russian mobsters because he interrupted a date with Vanessa. When his assistant Wesley dies, we see Kingpin snap the same way. Although I thought it was a bit weird, I enjoyed the effort they put into it rather than making him another crazy villain. Along with the development of Kingpin, the development of Hell’s Kitchen as a city was great in the first season. In the first episode we are introduced to the different crime bosses in this show. They all specialize in one thing and all of them control the crime in the city. We soon realize that Kingpin plans to take the city for himself. I love the build-up to that in this show. One by one the crime bosses are taken out. Everyone died except the elderly Asian women. It showed Kingpin’s brilliance but also patience. He used everything in his arsenal to get rid of the crime bosses, and he also used Daredevil to his advantage. By making this a 13 episode show, Marvel let us really understand the corruption within Hell’s Kitchen. It might have been tough to do that, develop Kingpin, and develop Daredevil all in one 2 hour origin movie. This city was literally controlled by Kingpin. He had cops, media, and every junkie on the streets in his pocket. The show did a great job building the world around Daredevil. Honestly, at one point in the show, I didn’t know how Daredevil was going to take Kingpin down, or if he was going to take him down at all. Normally, superheroes usually don’t come from the streets. Not all, but most superheroes, especially in Marvel have been privileged throughout their lives. Iron Man, The Fantastic Four, Hulk, Spider-Man, the list goes on. They become heroes to protect the little guy. They also battle personal demons as well. Heroes like Daredevil, who come from corruption and gang violence have to deal with an entirely different set of problems. The X-Men deal with different societal problems, but with the human race, not with the city. Daredevil in this show deals with everything all heroes deal with, on top of a city where he doesn’t control anything. Batman is the same way, but Bruce Wayne as a man has loads of influence. I always wanted Bruce Wayne to put himself out there more in the comics. Build new infrastructure for Gotham, run for Mayor, something. He has the money to do it. His method of being Batman is effective as well, but I love the grassroots approach of Daredevil. He honestly doesn’t really have a choice, but it was interesting to see that side of things. He’d rather infiltrate the structure than build it. Even if he had money, I don’t know if he’d change his methods as Matthew Murdock. Mainly because he knows how corrupt something can be no matter how much cash you throw at it. I suppose Batman knows that as well, but he has more than just money. He has wealth. Daredevil’s friends in this show are pretty great. Karen Page’s introduction into the show was a crazy one. She started off a bit whiny to me, but I’d probably be the same way waking up with a dead guy on my floor. She really evolves as the show goes on. When they try to bribe her into keeping her mouth shut, she realizes her role. She doesn’t accept that role at all and becomes somewhat of a Daredevil herself. I love when TV shows give us consequences for dumb actions, whether it be good guys or bad guys (Game of Thrones is a master at this.) When Karen killed Wesley, it was satisfying to see her finally stand up to the system that had turned her life upside down. It was also satisfying to see someone like Wesley, who couldn’t stop smirking even if you paid him, slip up when throughout the entirety of the show, he prided himself on his keen sense of business. Foggy was a fun character. The character did a good job being comic-relief. But I enjoyed that it went a bit deeper than that. The adventures of him and Karen didn’t feel like side work while the big boys battled in the streets. I figured they would play some role in helping bring Kingpin down. The part where Foggy annoyed me on the show is when he found out about Matt. I understand his frustration, really I do. The episode even did a good job showing us the nature of their friendship. We learned that a big thing with Foggy when it came to Matt was trust. He felt responsible for Matt in a way. He obviously sensed that Matt could do somethings by himself, but Matt was completely blind in Foggy’s eyes. Telling him things like someone shrugged or helping him avoid a set of stairs were important to Foggy. Still, I got the sense that jealousy was a main reason for him being upset with Matt. Obviously, I don’t know what’s going on in a writers head, but I don’t think Foggy would have been this mad at Matt, if Matt didn’t save Karen and Karen was smitten with him. It showed later on in the show because when Foggy started sleeping with the lawyer from Landman and Zack, he calmed down a bit. But overall, he was an awesome character. Claire and Ben are the other two supporting roles here. Claire was really handy because she patched Daredevil up when he needed help (which seemed like all the time.) Ben was an older reporter that Karen was talking to about bringing Kingpin to justice. Claire’s role in the show is cut short after a couple of episodes. I enjoyed the budding romance between her and Matt. He definitely needed after some nights. I was a little bummed for her to not be on board with what he was doing. I thought she may become an Alfred type for Matt, but she got caught up in her feelings. Ben was a fun character. The scenes where he is with his wife is heartbreaking. You can tell there isn’t anything he wants more in the world than for his wife to get better. It was unfortunate because Hell’s Kitchen was a disease on good people in this show. Kingpin kills Ben because he went to a nursing home with Karen that housed Kingpin’s mother. Ben had just been fired from his job as a journalist but was going to take his stories about Kingpin to the internet. Closure had been reached on that part of his life. It was tragic to see his feet twisting as Kingpin choked the life out of him. The supporting cast in this show played a huge part in the story overall. Just like Nolan’s trilogy, this show gave us a taste of what good and evil looks like in Hell’s Kitchen. They came in the form of Daredevil and Kingpin sure, but the show used the characters to show us the many faces of a truly diverse city. More superheroes need this type of approach. I love the world building here. Marvel doesn’t have a ton of heroes they could do shows like this with, but DC has plenty. Martian Manhunter, Captain Atom, The Birds of Prey, Justice League Dark, Justice League of America, Shazam could work here, there a ton of options. Marvel still has Iron fist and Luke Cage to come out as well. Both of those shows should be great. Still, Daredevil is the perfect hero to start this Netflix experience with, because of who he is. Marvel may be able to expand and do more characters in the future on Netflix. But so far, they have a pretty great start. Please make sure to follow me on Twitter @Hero_Review If you have any thoughts on this review, please feel free to comment, share, and like it as well. Did you like? Did you hate it? Please let me know what you think! Until next time!